Cranachan is the name of a classic Scottish dessert. 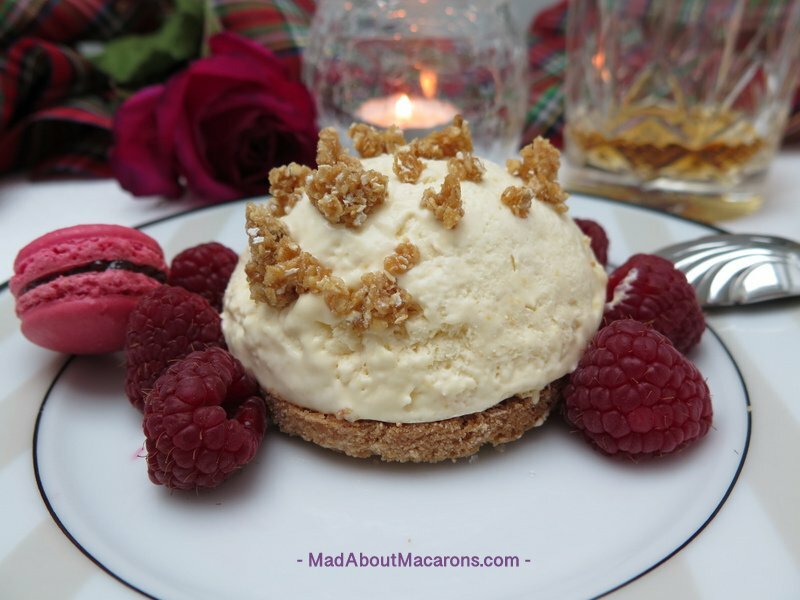 It’s so easy to put together and is made with simple ingredients: cream, honey, oatmeal and Whisky and layered with fresh Scottish raspberries. Here I’ve revisited the Scottish dessert with a French twist by turning it into a Cranachan Parfait. 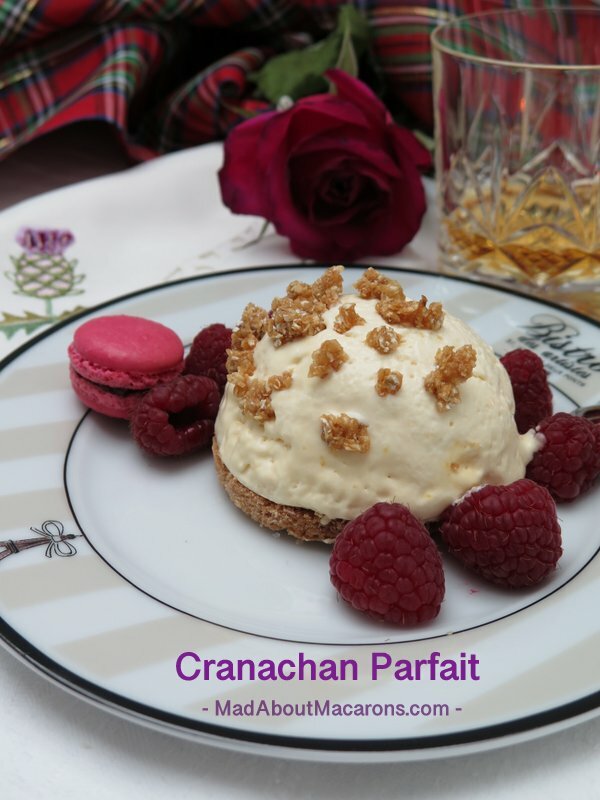 The Cranachan parfaits are soft honeycomb ice creams (no-churn) with a touch of Malt Whisky, topped with an oat praline crumble and served on a disk of Scottish shortbread then topped with raspberries. The Scottish Cranachan dessert was originally served to celebrate the summer harvest festival. No matter how much people say their raspberries are better, there’s nothing to beat fresh Scottish berries! Even the best French ones don’t match up to them, in my humble opinion. However, when it comes to the major Scottish celebration dinners such as Burn’s Night on 25th January and Saint Andrew’s Night on 30th November, we’re always short for fresh, seasonal raspberries. Luckily at our local Farmers’ market yesterday, I found some delicious raspberries – from Morocco! Surprisingly, they were full of flavour but as I prefer to buy local and seasonal, the berries are just for show here. Without fresh berries, thinly spread some good quality raspberry jam on the shortbread rounds before placing the Cranachan parfaits on top. For the parfaits, I took inspiration from chef, Anne-Sophie Pic, who makes a vanilla parfait by making a hot syrup and pouring it directly onto egg yolks and whisks until frothy. She then adds whipped cream and turns it into spherical moulds. Here, I replaced the syrup with runny floral honey (ideally in Scotland, use heather honey) and since I was adding Whisky to the cream, doubled the portion of egg yolks in order for it to solidify more in the freezer, even although they will still be beautifully soft. If you prefer a stronger-in-alcohol Scottish dessert, then try this non-churn Drambuie ice cream, delicious with chocolate ginger fondant cake! Although made the night before, the parfaits can keep in the freezer for up to 10 days, so it’s parfait to prepare this dessert in advance. I’ll post a separate recipe for Shortbread later – as my Granny’s Black Book of recipes contains several! Here I’ve used one of my favourites which uses more butter and, once the Shortbread is still warm and soft out of the oven, just cut out disks the same size of moulds. No moulds? No worries. This Cranachan Parfait recipe doesn’t have to be made using moulds. Make it easier by placing the cream into a cake tin lined with parchment paper and freeze as a whole block, cutting off slices when ready to serve. Instead of oatmeal for the traditional dessert, soaked in Whisky overnight, I’ve made a simple praline with porridge oats to add some crunch for the texture. 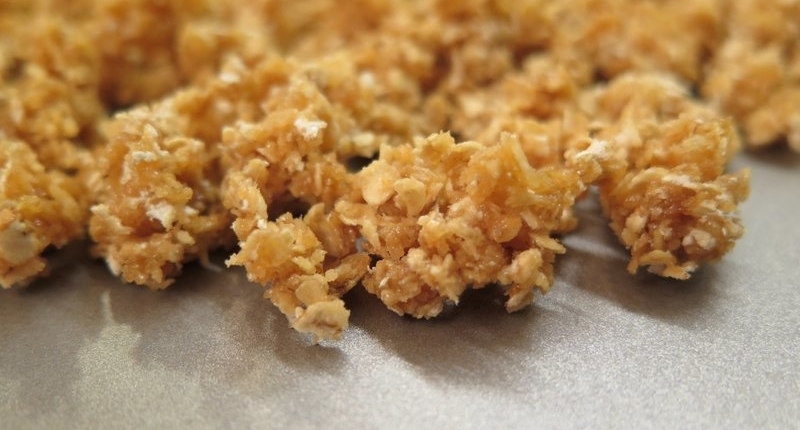 If you love crunchy praline on desserts, try this nutty nougatine recipe. Want to go the Full Monty? 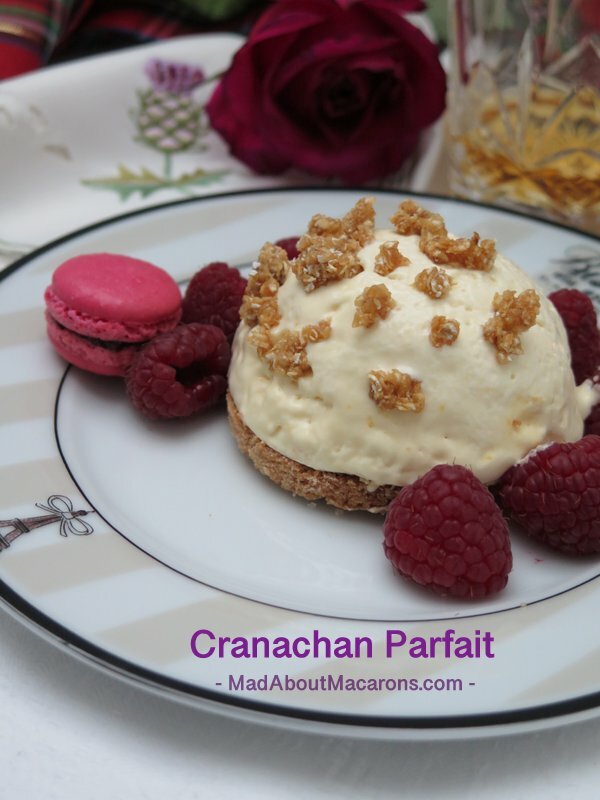 Serve with Cranachan Macarons, the recipe of which is in my first book, Mad About Macarons. Cranachan Parfait, a French twist to the traditional Scottish dessert of cream, honey, Whisky, oats, served with raspberries, buttery shortbread and topped with a crunchy oat praline. Chill a large bowl in the fridge for the cream. Place the egg yolks in a large bowl, heat the honey without boiling it and pour it over the yolks and beat with electric beaters (or a stand mixer) for about 10 minutes until thick and moussy. Add the Whisky and beat again until well mixed. In a saucepan, heat the sugar with a few drops of water. Just as it starts to change colour after about 5 minutes, stir using a wooden spoon until the sugar is completely dissolved and the caramel is medium golden. Add the butter and stir to mix well then pour in the oats. Stir until the oats are well covered then immediately transfer to a baking tray. Preheat the oven to 180°C/160°C fan/360°F/Gas 4. When ready to serve, place the shortbread disk on each plate (spread each with raspberry jam if no fresh raspberries), turn out the frozen parfaits at the last minute and place on top. Sprinkle with the oat praline and, if using, serve with fresh raspberries. 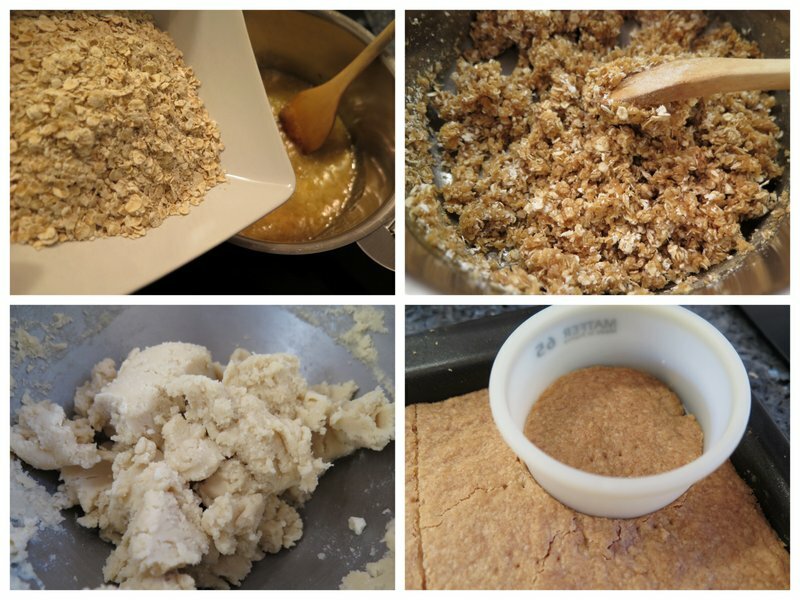 This recipe can be made even easier without the moulds or shortbread. 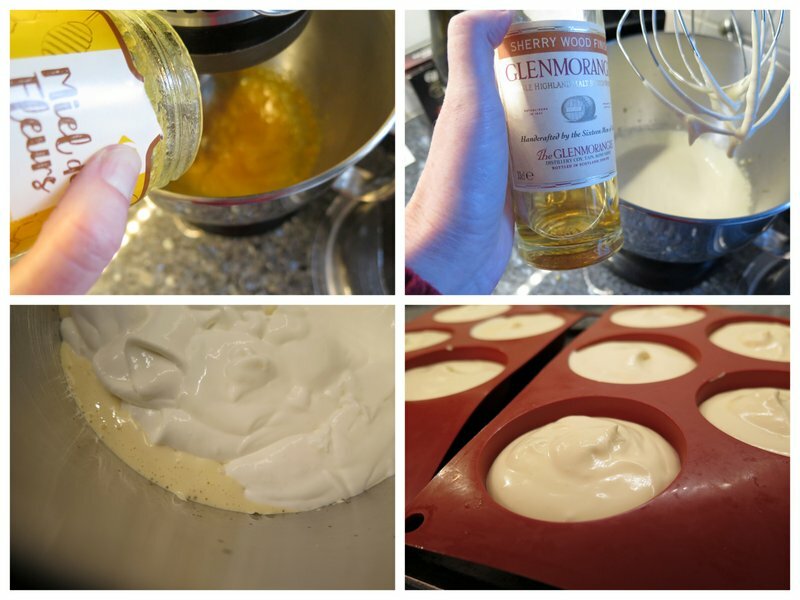 Simply freeze the honey and Whisky cream in a lined cake tin overnight and slice before serving. Serve with the oat praline and a glass of single Malt Whisky. Store the egg whites in the fridge for 3-4 days and make macarons or financiers with them (recipes in my books). Otherwise freeze the whites until later! 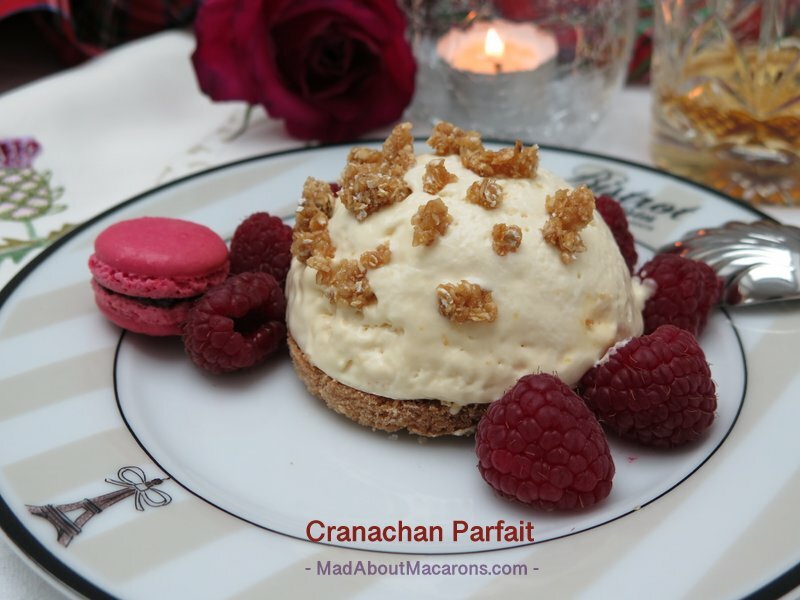 If you would like to try the classic, more traditional recipes for Cranachan, see my Scottish friends’ recipes, from both Christina’s Cucina and Janice’s Farmhouse Kitchen version, based on a Whisky Mac. If you prefer to make this a gluten-free dessert then replace the shortbread with a giant pink macaron. There’s a whole chapter about giant macaron desserts, also in my book, Mad About Macarons! Enjoy this for any Scottish occasion, or at any time of the year and ideally serve with a good single Malt Whisky. Incidentally, the Gaelic word for cheers translates as Health, just like the French. Sign up for your free email alert, straight to your inbox: you choose from daily, weekly or monthly to be informed when new posts are fresh on the website. Your email is NEVER SHARED and, as always, you can easily opt out at any time at the bottom of every email. P.S. This is part of the egg yolk recipe database, as it uses 4 yolks. Keep the egg whites for 3-4 days in a clean jam jar in the fridge (or freeze until ready to bake) to make macarons, financiers, tuiles or meringues from my books and le blog!